DIY. DIY Wood Pallets Projects BOX SET 2 IN 1: Recycle, Reuse, Renew! 50 Amazing Upcycling Ideas For Your Home! BOOK #1:Wood Pallet: Recycle, Upcycle, Repurpose. 12+ DIY Wood Pallets Projects For Your House! This book is a comprehensive guide on how you can take common warehouse pallets and up-cycle them into some of the best furnishings and household items you have ever seen. With a little imagination and effort these pallets can be taken from the concrete floors of the warehouse straight to the show room. You may have never imagined that you could take an old beat up pallet and turn it into designer furniture but with these boards you can truly transform your home and your life. In this brief but concise e-book we attempt to cover all the aspects of this popular new building trend. Pallets take on a life of their own and can be shaped into just about anything that you can think of. They can be made into furniture, but they can also be made into great works of art. 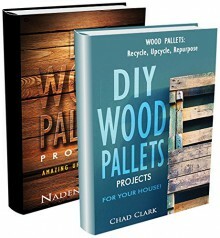 BOOK #2:DIY Wood Pallets Projects: Amazing Upcycling Ideas! They’re sure to spruce up your home, and the great thing is that you can leave them unfinished to give it a rustic feel or you can paint them any color you’d like to make them look more modern and chic! Wood pallets are just a few pieces of wood nailed together in order to ship goods, so they’re essentially free wood when you can find them from manufacturers or at residential home building sites! Download your E book "DIY. DIY Wood Pallets Projects BOX SET 2 IN 1: Recycle, Reuse, Renew! 50 Amazing Upcycling Ideas For Your Home! "Buy Now with 1-Click" button!